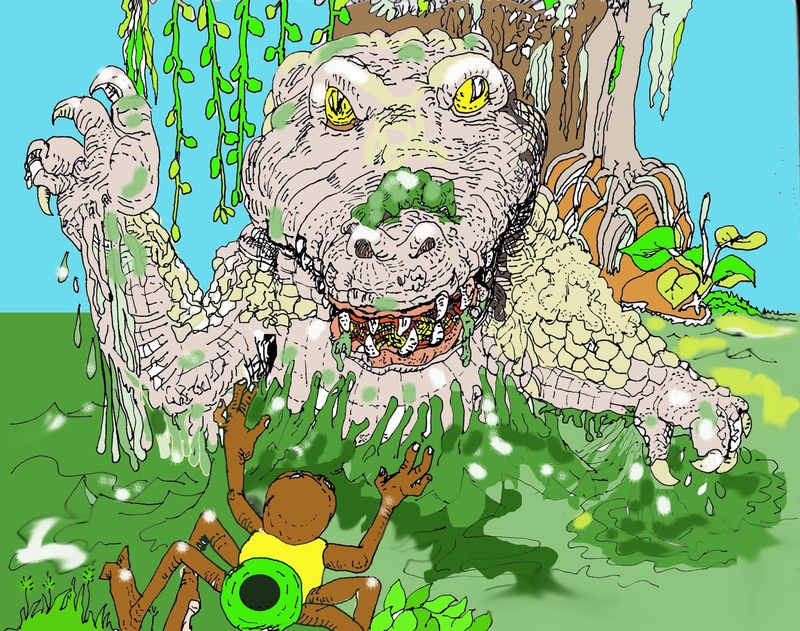 The Swamp Dragon rose out of the Everglades, startling Anansi. Anansi, who was feeling his age,had gone to the Florida Everglades in search of the Fountain of Eternal Youth. He had heard a story about this magical Viagra-like spring that would allow old men to regain their youthful vigor. In the Everglades he came across a Seminole village’s communal garden. Captured and tied to a log for a whipping, he begged the chief to forgive him. “Hah! So, how are you going to pay for the honeydew melons?” Asked the Chief. All Anansi could do was stammer. “I tell you what... Catch the Swamp Dragon and you go free!” Said the Chief. The village cracked up. “Dat’s easy,” The cocky Spider-man cracked. When everyone had gone, Anansi went into the bushes and cut the longest, skinny Black Mangrove log that he could find. He trimmed off the branches and leaves and dragged the crooked Black Mangrove pole to the lair. Anansi stood on the bank of the stream, doing a little jig; he began to beat the machete against the pole. Each slap of ther machete gave off a “Twingggg!” Anansi shouted the Asanti name for crocodile to the beat of steel against wood. Twingggg twingggg! The steel blade rang out. “Á have something to tell you." A pair of eyes and nostrils silently broke through the smooth surface the stream’s deep hole. Then the rest of the body of a humongous alligator surfaced. Anansi stepped back in surprise. "Who is making this racket outside of my home?" The Swamp Dragon said. "You don't know me but I just arrived here in search of the largest crocodile in the world." Anansi said. "Well bug off. 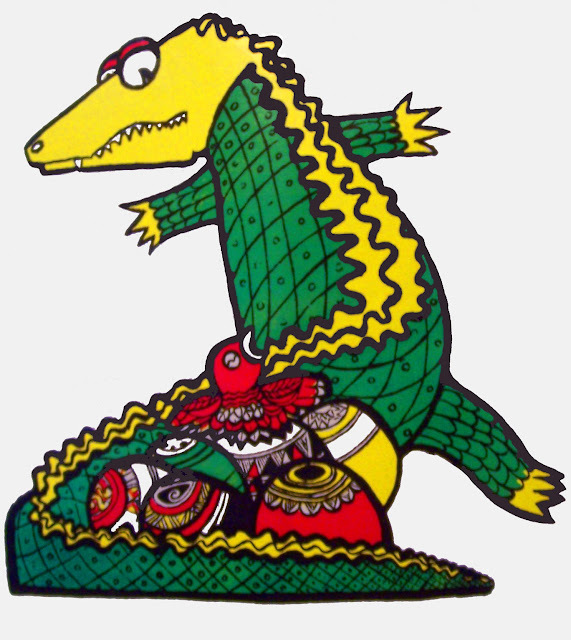 I am not a crocodile." The alligator said. "Alligator, crocodile, whatever! I am here to measure the largest reptile in the world. By the looks of it, you are smaller than an African Nile crocodile." Anansi taunted. "Says who?" Retorted the Swamp Dragon who was also known as the “Beast of the East”. "Well, the only way to prove it is to take your measurement." Anansi challenged. The alligator had his pride, so he crawled out of the water and told Anansi to take his measurement. Anansi took 14 paces from the alligator's snout to his tail. "I know that you are taller than you seem. However, I have to ask you to stretch out a little more to beat the record," he said. The alligator complied and Anansi walked off 14 and a half paces. Then he said, scratching his head. "No. Á know we can stretch you a little longer. Here, let me lay this pole alongside you. Ok, now… Let me tie you tail to the log. Good. Now stretch you snout to the end of the log. Don't move. Just let me tie you snout so that you won't slip back." "Issfff thisfff good enough?" The Swamp Dragon hissed through his clenched, tusk-like, ivory teeth. "One moment," Anansi said. “Á must tie your back to this pole to keep it firm against you.” When Anansi had tied the alligator’s midsection securely to the pole, he said. “Now, Á just want to tie your tippi-tail to the end of this pole so that I can get your best stretched out length.” Then Anansi tied the alligator’s tail-end to the pole and stepped back. “Mmmhh. You are almost as long as the pole. Let me get the tribe to make the judgment. Anansi ran off and got the tribe. Everyone was astounded. Anansi did something that their hunters had been unable to do for years. MORAL: Alligator lay egg, but him no fowl. Above: John White’s watercolors and a deBrey inspired print of the 1585 appearance of Powhatan Indians of Virginia. By 2040 America will be made Native again. Thanks to the Hispanic cousins from the south and the low European-American birth rate. 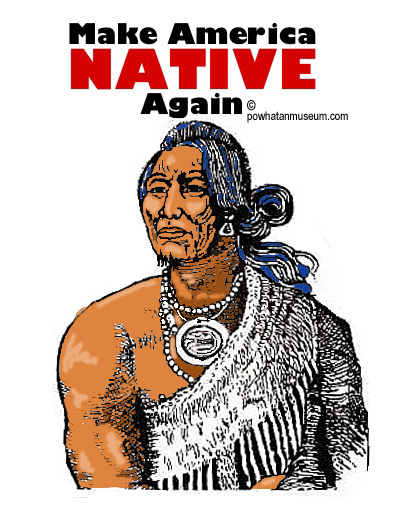 As an immigrant married to a Native American for over 50 years, from the historic Powhatan Confederacy and having been intimately involved with Native issues since then, I tend to see the current fear of the re-Browning of America from a unique vantage point. The current American political fear is the pending loss of European power within a few coming decades. Since the founding of Jamestown by the Virginia Company of London in 1607, Europeans have been in North America for just 411 years. The country was founded on a peculiar history, steadily increasing their numbers by inviting other Europeans in to partake of stolen Indian territories and the forced importation of Africans for enslavement..This founding of the USA, as with all countries in the Americas was on ancient Amerindian foundations. 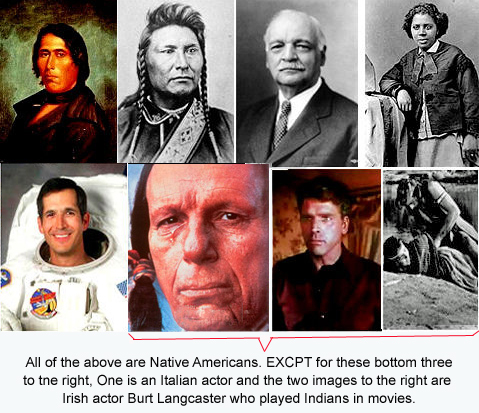 Quickly blanketing rich Amerindian cultures Europeans, beginning with the Spanish in most of the Americas, were followed by British bullies bent on getting a piece of the North American pie. The English had learned their craft of empire from the expanding Roman Empire. The Spanish had learned their colonizing techniques from the Moors of North Africa who expanded into southern Spain. This history of first coming in as traders followed by subtle conquest in Europe has its forerunner in Ancient Egypt by Greeks, Romans, Hittites and other neighbors. Nubian Kings saved the day and returned Egypt to the Egyptian pharos. England threw out the Romans to regain control of Londonium. The British were eventually kicked out of North America, Africa, Asia and the Caribbean.All empires eventually fall. After the American Revolution the USA began a campaign towards empire-building and the eradication of Native Americans. The election of the current president who campaigned on a wall between brown Mexico, strengthened by anti-brown rhetoric, caging brown Amerindian infants, and deporting indigenous Amerindian mothers and fathers is a sign of Eurocentric fear of “Making America Native Again”. This governmental policy is especially poignant since some of the refugees only speak their own Amerindian language. Amerindian ancestors have been crisscrossing the entire hemisphere for thousands of years before the arrival of aliens from the Eastern Hemisphere. An example of this Amerindian migratory practice, was the Uto-Aztecan speakers (from New Mexico with relatives in Utah) who migrated south into Mexico to form the Triple Alliance of the Aztec (Mexica) Empire. So, some Mexicans crossing a belated 1800s border, made possible by America's forcing their expanding country/empire through the Mexican-American War, are "just returning North". is "Make America Great Again". 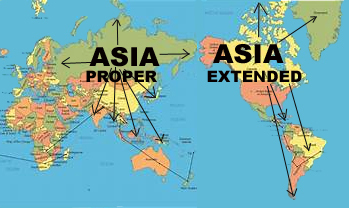 THE AMERICAS AS “ASIA EXTENDED”? Mix up the world’s population and every 3rd human you meet would be Chinese. Every 5th person would be from India. The rest of the continent includes millions more of other Asians in East Asia and the Pacific. Added to these Asians, approximately 47,834,251,490 indigenous people who are genetically “Asiatic”, live in 16 countries in South and Central America. There are roughly 3,672,790 in the USA and Canada. These overall numbers do not include the indigenous Caribbean populations or the extremely large meztizo and other African, European and Asiatic populations with indigenous American genes in this hemisphere. 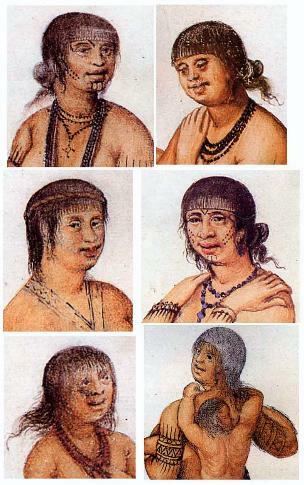 Even Europe (and possibly other areas) had its mixing of indigenous Americans soon after Columbus brought some Taíno back to Spain. Some meztizos in the Americas obviously relocated to their father’s homelands in Europe and Africa (For example, Jamaican Maroons to Sierra Leone and African Americans to Liberia). At this time in history the Jamaican Maroons had been the result of the assimilation into the Yamaye Taíno population of the mountain Cimarrones, who themselves had escaped subjugation on Spanish ranches. (Both the words “Maroon” and “Seminole” came from Cinarron.) Some African Americans had themselves mixed with their local Native American neighbors. Is the vast Western Hemisphere of the Americas also a part of Asia? Some folks think so. However, not according to some writers. Yet, indigenous Americans, they contend, are believed to have come “from Asia over a land bridge that connected both Asia proper and the Americas.” Indigenous Americans, at the time of Columbus, were genetically, philosophically and religiously “Asiatic”. Columbus was on his way to Asia when he collided into the Caribbean homeland of these Asiatic peoples, the Taíno and Island Carib. To him, they appeared to be Indios/indu. Sailing down from the Guanahani in the Bahamas, he arrived in Cuba. There he sent out an overland expedition to find the home of the Great Kahn of China. Until his dying day, maybe he was rightfully convinced that he had encountered, explored and temporarily governed Indians (Indios) from the outer reaches of Asia’s subcontinent.